Keating took a shine to Dondi, the faithful companion of Imtra’s longest tenured employee, Marco Luscombe. 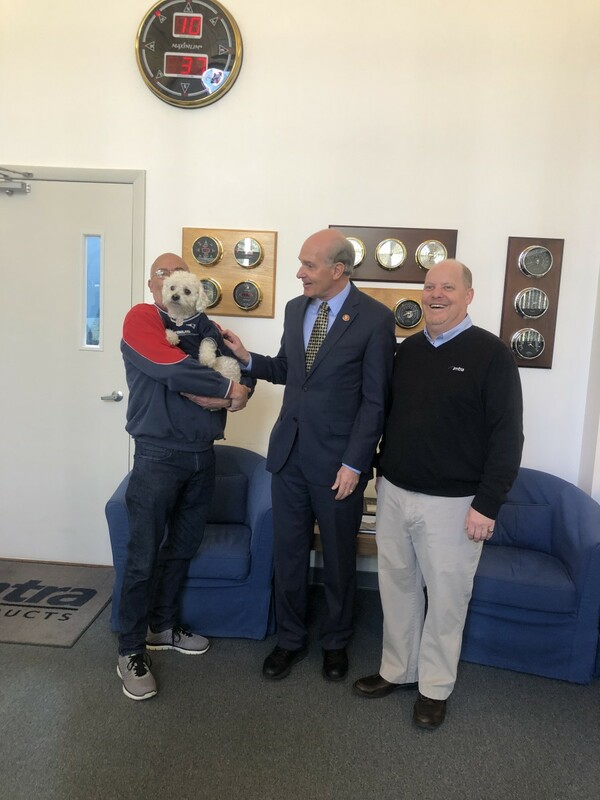 U.S. Rep. Bill Keating toured Imtra Corp.’s New Bedford, Mass., facility this week, meeting with workers and discussing issues that affect the marine industry. During the visit, Imtra president and CEO Eric Braitmayer highlighted his concerns about the ongoing trade war, which has caused the price of raw materials to increase and reduced demand for Imtra products. Braitmayer also highlighted Imtra’s work with marine companies and partners in the area to develop local maritime and vocational schools. “We also talked about workforce issues and how his district — 9th of Massachusetts — could take a leadership role in being a place where maritime entities want to grow and thrive,” said Braitmayer. Nicole Vasilaros from the NMMA flew up from Washington D.C. to participate, Braitmayer said. “She and the NMMA team deserve all the credit for getting Congressional attention on Imtra and our industry,” he said. Keating took a liking to the company’s “spiritual leader,” Dondi, the faithful companion of Imtra’s longest tenured employee, Marco Luscombe. “You may not be able to see, but Dondi is rocking his Patriots jersey too,” said Braitmayer.